This Wednesday is our PTA meeting at 6:00pm and the World’s Finest Chocolate money is due. Just a reminder to all families to please complete the Parent Survey by April 11th. Keeping our children safe is our top priority here at PS/ IS 499. We educate our students about road safety and the importance of following traffic rules in order to prevent accidents that can lead to serious injuries and in some cases unnecessary deaths. Please talk to your children about using the crosswalks at each end of the building at all times. It is very important students understand they are not allowed to cross the driveway or cross in between two school buses, because it is extremely dangerous. Additionally, we are asking parents to model this safe behavior so that we can promote traffic safety at all times. 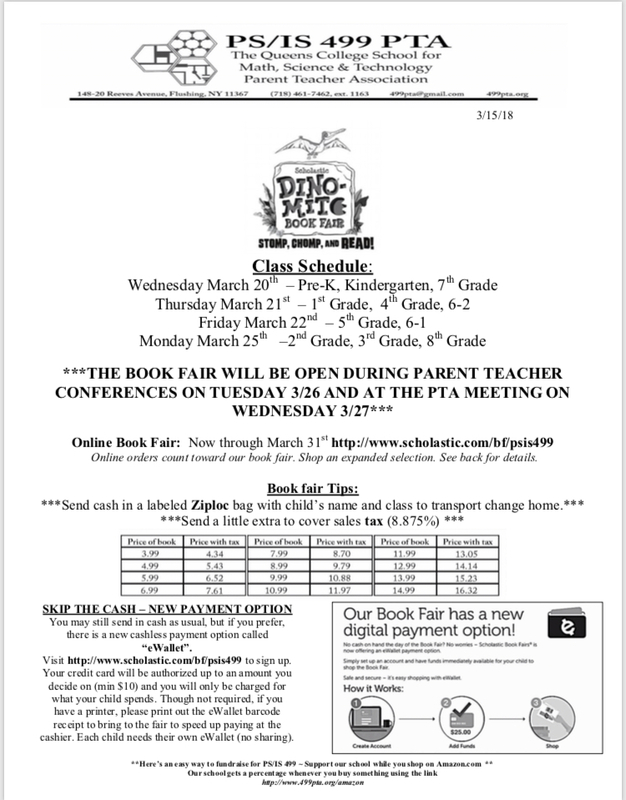 The Scholastic Book Fair will be open during parent teacher conferences in the 4th Floor Dance Room on Tuesday as well as after the PTA meeting on Wednesday. Many of our teachers have wish lists both at the school fair and online at http://www.scholastic.com/bf/psis499 . Thank you for your support. ***NEW PAYMENT OPTION: You may still send in cash as usual, but if you prefer, there is a new cashless payment option called “eWallet”. 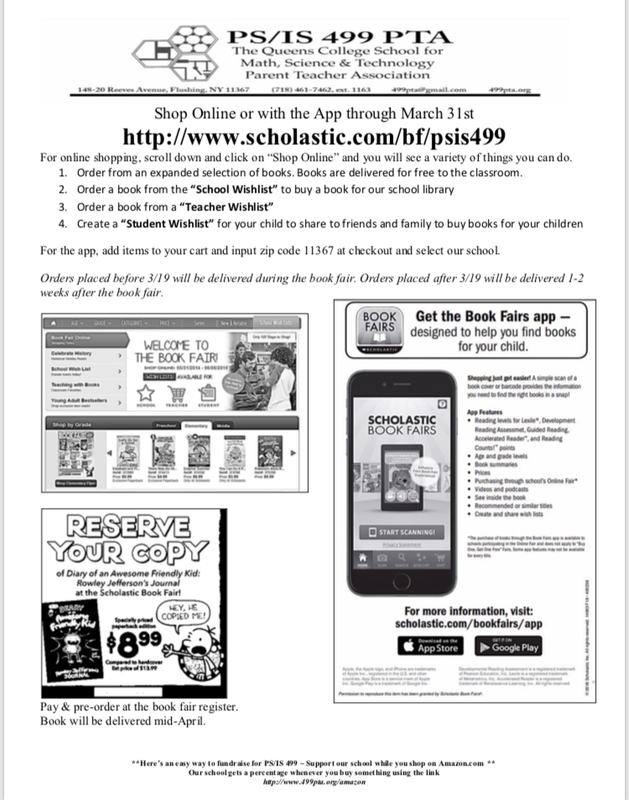 Visit http://www.scholastic.com/bf/psis499 to sign up. Your credit card will be authorized up to an amount you decide on (min $10) and any money not spent will go back on your card. Though not required, if you have a printer, please print out the eWallet barcode receipt to bring to the fair to speed up paying at the cashier. Each child needs their own eWallet (no sharing). Shop an expanded selection, set up a student wish list to send to friends and family, or shop from school library and teacher wish lists. Online orders ship free to our school 2-3 weeks after the fair ends. The Online Book Fair is Open!! 1. Order from an expanded selection of books. Books are delivered for free to the classroom. You may still send in cash as usual, but if you prefer, there is a new cashless payment option called “eWallet”. Visit http://www.scholastic.com/bf/psis499 to sign up. Your credit card will be authorized up to an amount you decide on (min $10) and you will only be charged for what your child spends. Though not required, if you have a printer, please print out the eWallet barcode receipt to bring to the fair to speed up paying at the cashier. Each child needs their own eWallet (no sharing). SCHOLASTIC BOOK FAIR IS COMING SOON!!! See attached flyer for additional information about volunteering, donating books to classroom and school libraries, and online shopping.